How to download the ezTalks Meetings software? ezTalks provides apps for Windows, Mac, Android and iOS. Here is an article about how to download the app on different devices. 2. Go to the download center and click on Download for Windows. 3. Open the downloaded ezTalks.exe file. If you receive an alert about opening the file, click Open or Run Anyway. 1. ezTalks Meetings software supports Mac OS 10.10 and later version. 2. Go to the Download Center page, and click on Download for Mac OS X 10.10 and higher. 3. 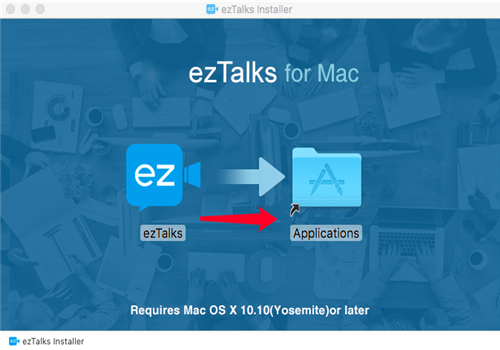 Open the downloaded ezTalks.dmg file and move it to Applications. 1. ezTalks Meetings software supports Android 4.4 and higher version. 2. Search ezTalks Free Cloud Meetings from the Google Play to download the ezTalks app. The apk file is also available on the ezTalks Download Center. 1. ezTalks Meetings software supports iOS 9.0 and higher version. 2. Search ezTalks Video Meetings from the Apple Store to download the ezTalks app. Next, learn the quick start guide as host to know how ezTalks works.